Of course I’ve heard about Minecraft. How could I not? The crazy best-selling, square-loving video game is practically everywhere and has been for years now. I also knew the super skinny basics on Minecraft: It’s all about virtual, 3-D worlds engineered by players using square blocks. Like building with LEGOs, but on a screen, and square. Plus, there’s a dude named Steve, a cute, friendly pig of some sort and some semi-cute, totally un-friendly zombies. But that was kind of where my knowledge ended. Time to grab my pickaxe (insider joke — heyohh!) and dig into this fascinating if wildly addictive game. If, like me, you’re trying to figure out the basics for a kid who’s asking to get set up, or just to understand more about what exactly your children are doing whenever they manage to earn a few moments of screentime, I hope this guide to how to get started on Minecraft PE helps you out. There are tons of parents who were Minecraft newbies once too. Don’t be shy to ask those who have gone before you. In this case, it was me asking our editor Liz. Her girls had fallen for Minecraft a few years ago, and so she asked Christina (whose kids were already on the wagon) to put together a smart Minecraft primer for parents in similar boats. Definitely read it! It set me up proper. Liz also suggested starting out with Minecraft Pocket Edition (PE). For those of you wondering just what that means, the original Minecraft game was created for desktop computers, and even though the PC version is still the most popular version of the creative building game, PE is the mobile option for iOS and Android which is definitely a fave with Minecraft gamers on the go. It’s also perfect for today’s kids who may have more access to tablets or hand-me-down phones than to computers. And frankly, with the PC version of Minecraft ringing up at nearly $27, the PE download at $6.99 — while it has some more limited features — is an alternative parents may feel more comfortable with, and it’s way cheaper too. Download the app, hand over your iPad or tablet to your child and step back. I mean it. Don’t hover; this is watch and learn time. The game is designed for discovery, so let kids do just that on their own. Allow them space to feel their way around and put their imaginations to work. Now keep in mind this isn’t a game in the traditional sense. It’s guided by kids’ own inclinations and imaginations, there are no real rules (except the rules of physics) and no “win.” That also means kids may get frustrated when things don’t go smoothly at first or they don’t quite understand how to manipulate the action. This, I think, is a part of getting into the finer details of the game. It’s a lot of trial and error, recasting, and beginning anew. There are official guidebooks like the Minecraft: Essential Handbook to help players get a better handle on the square worlds they’ve created. However, this being on-screen action, don’t neglect the massive number of on-screen Minecraft YouTube videos that help guide kids through the action and inspire creative ideas. 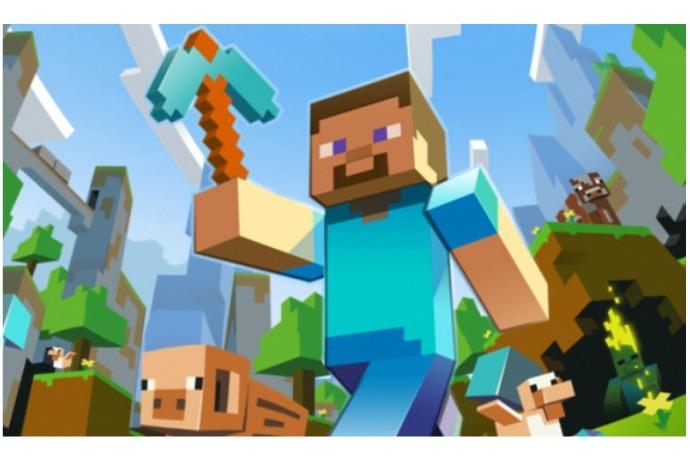 There’s a great post at Common Sense Media on the12 best kid-friendly Minecraft Channels on YouTube. Liz’s kids highly recommend you start with Stampy Longnose. 26 million viewers for his channel trailer can’t be wrong. She also cautions that you be prepared to have his upbeat, British voice stuck in your head for life. 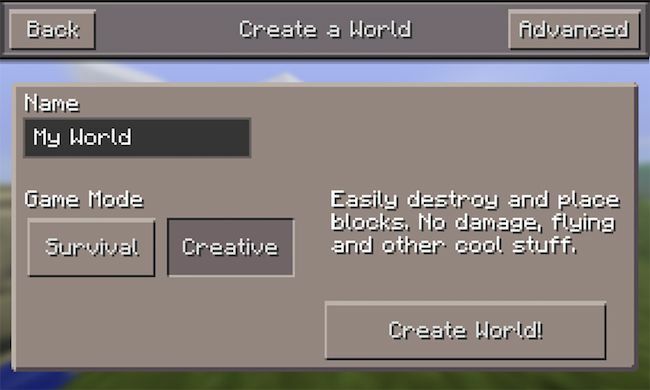 Much like the desktop version, Minecraft PE lets player choose between two modes. 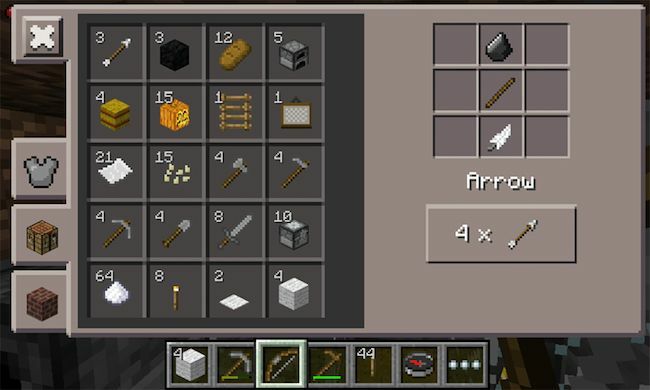 Creative mode is where you can get right to it and start building and creating your world, fully equipped with all the tools (above) and supplies you’ll need. You have a limitless supply of stone bricks, wood planks, and other materials to make your castle or fort or hut or amusement park or Zombie Camp or Harry Potter Library. In survival mode, you’re starting from scratch. You’ll have to earn, find and forage for everything you need to build a house, make tools and, well, survive. Partly because of those zombies I mentioned. In Survival mode, there are plenty of things-that-go-bump to keep you on your toes, from creepers (above) and zombies to giant spiders and skeletons. If any of these unfriendlies get you, all the tools and supplies that you’ve managed to gather get wiped away and you’ll need hunt, harvest, mine and muster an inventory all over again. Creative is also perfect for younger kids who can get pretty upset when a world they’ve so carefully creative gets destroyed by hostile mobs or an accidentally tipped-over bucket full of lava. As fun as the mobile take on the game is, it’s also not as “free-play” as the computer version; there are definitely some limitations. First, unlike the multi-player servers, you can only play Minecraft PE with others if you’re both on the same WiFi network. In other words, siblings, playdates, parents. This is not a bad thing though — it’s actually a good way to limit play and keep it safer, since the other people they invite into their worlds are people they know in real life and (hopefully) less likely to try and do damage. Also, it’s important to know that you can’t transfer content from the computer edition to the PE version. However you can transfer PC content to gaming systems like XBox. Some of the cooler things (like expansive world maps) and more essential elements (like electricity) for building effective structures, are missing from Pocket Edition. But honestly, if your intro to this fun world is through Minecraft PE, there’s already so much to do and discovery it’s likely your kids won’t know what they’re missing. then again, don’t be surprised if you find yourself adding on capabilities with apps like Skins for Minecraft. If you know how much your kids love dressing up and changing their avatars in other games, then you can imagine that reskinning your characters with armor, masks, crazy hair or fun outfits is one of the most enjoyable aspects of Minecraft for a lot of kids. Overall: A final note for parents. 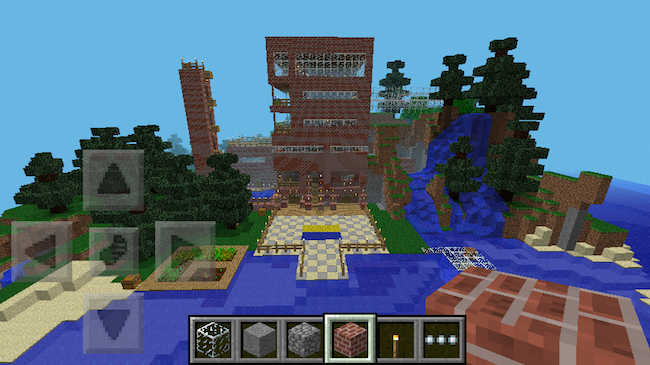 As someone who was originally skeptical, I have to admit that Minecraft PE is pretty spectacular. I have been completely impressed with — and surprised by — the educational component it holds for kids. Mastering Minecraft PE involves imagination, strategic planning, logic, and some basic physics understanding, and lots of spatial reasoning. Plus, I’m enjoying the new, juicy vocabulary words up for grabs, too. Like hearing my six-year-old talk so knowingly about “dimensions” is pretty rad. One note for parents: As we mentioned in CMT’s Minecraft primer for parents back 2013, there are some aspects of the game that some parents might not be totally cool with and you should be aware of. First, there’s an element of violence to Minecraft, if cartoon-y. In Survival mode, those unfriendly types — creepers, zombies, angry mobs — really do come after you at night with the intent to do harm and “end” you. Hearing your little kid say a zombie is trying to eat my flesh! can be disconcerting, to say the least. Also, when it comes to foraging for food, players may kill animals to get the needed food. While this is pretty much how humans have survived for millennia, it could potentially be an upsetting idea for some parents, or to younger kids who may not be aware that pork chops do, in fact, come from pigs. Still, it’s not a horror game and the 8-bit style animation makes even the scarier parts all pretty far from reality. So if like me, you think the benefits outweigh any potential watch-outs, just talk your kids through all aspects the game before getting them set up. That’s probably the smartest first step of all, before delving into the wild and wonderful world of Minecraft. Mine Craft has take over in this house. Thanks for the primer.